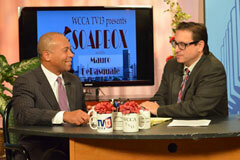 Governor Deval Patrick was a special guest of Mauro DePasquale’s on “Soapbox” Monday, Oct. 28th, 2013. The Governor was in Worcester making 2 announcements creating opportunity and growth for residents in central Massachusetts. At Quinsigamond Community College, a new general academic buidling will support the campus’ growing enrollment and a new state-of-the-art WRTA maintenance facility will support the region’s public transportation needs. Watch Soapbox #901 to see the interview.